Japanese game maker Square Enix pulls out its favorite PR chestnut, the countdown clock, and tosses up a teaser site for some video game. 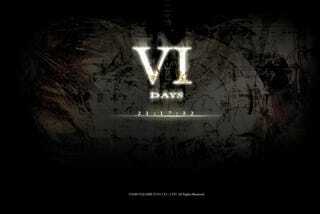 There's not much to the site: Some background art, text that reads "VI DAYS" and a countdown clock. Does it get anymore exciting than this? Yes, yes it does. The countdown ends in six days. Set your watches and check back for the thrilling conclusion, which will probably be before the countdown ends because of a leaked Japanese magazine scan. Or something.